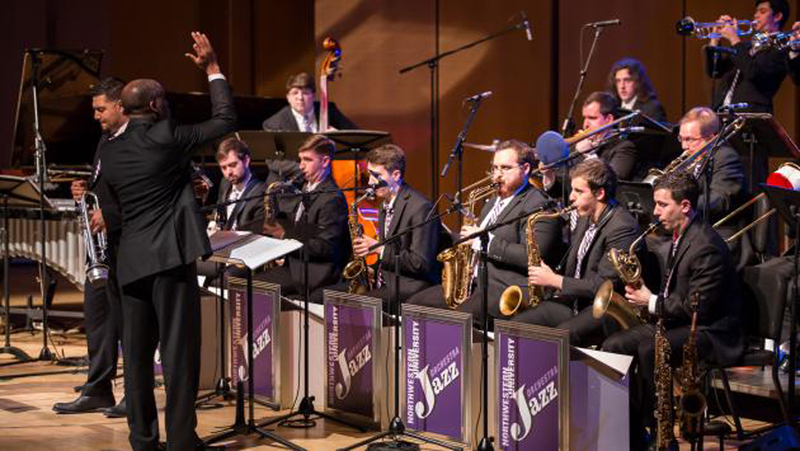 The Northwestern University Jazz Orchestra will perform a New Orleans jazz-focused concert in honor of Mardi Gras on Feb. 13 in Galvin Recital Hall. Audiences might notice something strange when attending the Northwestern University Jazz Orchestra’s Mardi Gras-themed concert on Feb. 13: some of the songs will require the performers to play without any sheet music. Jazzers are familiar with doing shorter improvisations, but trumpet player Sam Wolsk said getting through an entire tune without any score or lead sheet posed a real challenge to the group. However, Wolsk said that once the group found their groove, they ended up having a ton of fun, with people even getting out of their chairs and dancing around. While dancing musicians might be frowned upon by jazz purists at one of the group’s typical concerts, this blatant grooving to the music is appropriate for their New Orleans jazz set, Wolsk said. Unlike New York jazz — the style the group usually performs — New Orleans jazz was born from parades and people jamming in the streets, Wolsk said. Bienen senior Jared Decker, one of the drummers for the group, said the New Orleans jazz-themed program was the brainchild of Bienen Prof. Victor Goines, who serves as the Jazz Studies director and is a New Orleans native. Decker said Goines thought programming the musical style would be appropriate, as their concert is scheduled for Fat Tuesday, or Mardi Gras, a historically important holiday in New Orleans. No jazz band is complete without a strong drummer, but Decker’s role is even more important for New Orleans style, as he said much of the music originated from parades. Decker also noted that these parade-origins are part of New Orleans jazz’s predominantly oral tradition. Historically, different groups would march in the parade playing the same melodies, but all would sing different lyrics depending on where they first learned the tune, he said. Bienen junior Louis Danowsky, who plays saxophone in the group, said this oral tradition can be heard in the music itself. The originators of New Orleans jazz wouldn’t have played off of sheet music, but rather would have played off their fellow musicians, he said. “It’s one melody that keeps getting passed around (and) is treated like a dialogue between sections,” Danowsky said. “It mimics the way that there’s a dialogue between actual people. Asked what the hardest aspect of performing the music was, Danowsky laughed and said “we never play it!” He explained that although New Orleans jazz is important as the predecessor to other jazz forms, most jazz musicians rarely perform in the style. Lacking a long-standing exposure to all of the nuances and grooves of the music made it more difficult to perform with ease, Danowsky said. The best way to combat this problem for Decker was by listening tirelessly to acclaimed New Orleans jazz recordings. He said before he even knew what songs would be in the concert, he started listening to recordings in the genre just to get the grooves and rhythms in his head. Although the drummer has a soft spot for the classic tune “Big Chief,” he said he was excited about all of the pieces on the concert. “I think it’s gonna be a party,” he said.